While I’m always looking for creative ways to get more fiber, I’ve never had it in me to make chia pudding due to trypophobia. Bumps and holes give me major skin crawls and it’s all I see when I look at chia pudding. But here’s the thing: chia is SO GOOD for you. These little seeds came to fame as a dietary staple among the Tarahumara Indians (detailed in the book Born To Run). This tribe of super runners in the Copper Canyons of Mexico run of hundreds of miles with incredible speed and very little rest. So what kind of nutrients are in chia seeds? LIKE SO MANY. Omega-3 essential fatty acids, antioxidants, protein, calcium, iron, potassium, vitamins A, B, E, and D, as well as other key minerals. Even better, all that goodness is wrapped up in a small package, making chia one of the most nutrient-dense foods in the world. Two tablespoons contains 10 grams of fiber and 6 grams of protein. Ten grams of fiber is almost half your RDA if you’re a woman—amazing. Just like a smoothie: blend out the bumps and reap all the benefits of chia seeds. This method made for some extra creamy, deeelicous chia pudding that I’ve replicated three or four times over since it’s so easy to whip up. I didn’t have many toppings on-hand but a handful of chocolate chips or a dollup of coconut whip do nothing but good things for this easy pudding recipe. It’s never been easier (or tastier) to get a sucker punch of digestible fiber and nutrients. Blend all ingredients in a high-speed blender for at least 40 seconds. Store pudding in an airtight jar or container for at least 4 hours before eating. Leave an inch or so when storing as pudding will rise slightly. 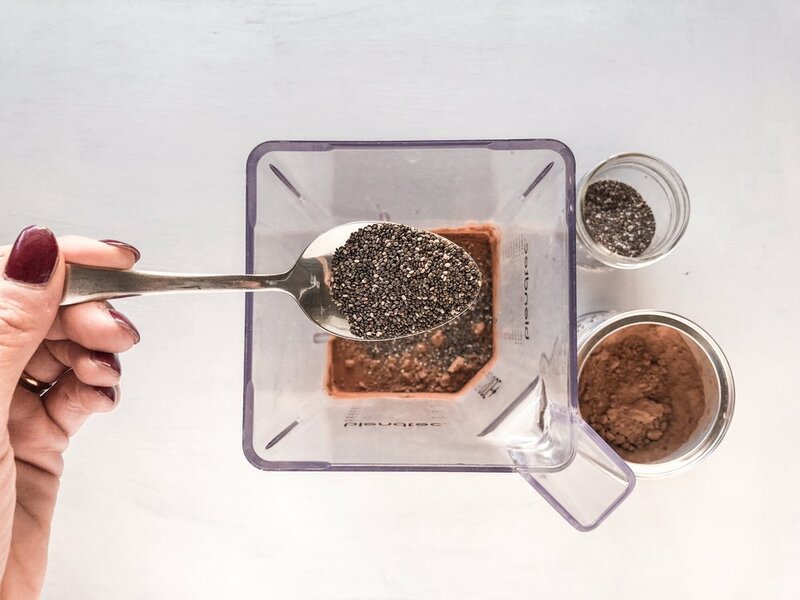 IF MEAL PREPPING: Chia pudding can be enjoyed up to 3 days if stored in the fridge.